Volunteers are needed to help sort and distribute free groceries and household items to those in need at the Free Pantry Organization in Costa Mesa. The Free Pantry Organization is also in need of donations of jars of peanut butter to offer to the needy. If you are able to donate, you may drop donations off to Victoria Sauer in room 202. 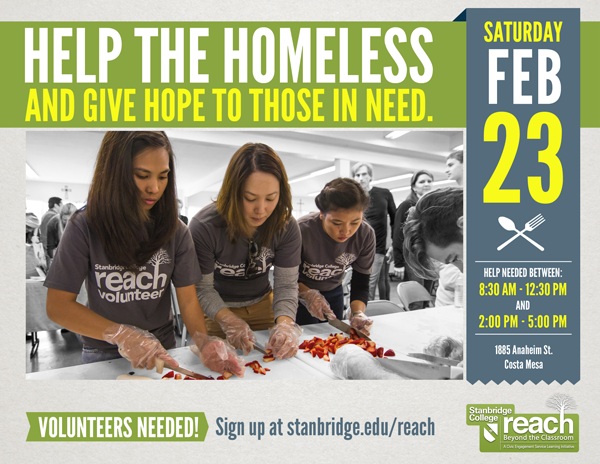 Volunteers are needed to help prepare and serve a warm meal to over 250 homeless and low-income people and families in Costa Mesa. With a little compassion and warmth we can join together and truly make a difference for those in need for our community.